Thanks again to DEVONtech for sponsoring Macdrifter this week. They make some of the most powerful document database and search apps on any platform. DEVONthink provides several options for syncing and backing up data automatically. The system works with the simplest project all the way up to a large complex database. All of the files, flags, tags and meta data are synchronized. Even the search index goes along for the ride so that everyone using the data sees the same stuff. This overview describes a sponsor's product. It happens to be something that I use and think is really great. The ideas and words in this post are mine. Syncing in DEVONthink is configured for each database independently. That means you can share one database on your local network and another database through Dropbox or WebDAV. Those aren't the only options either; DEVONthink provides several connection options for keeping data up to date. 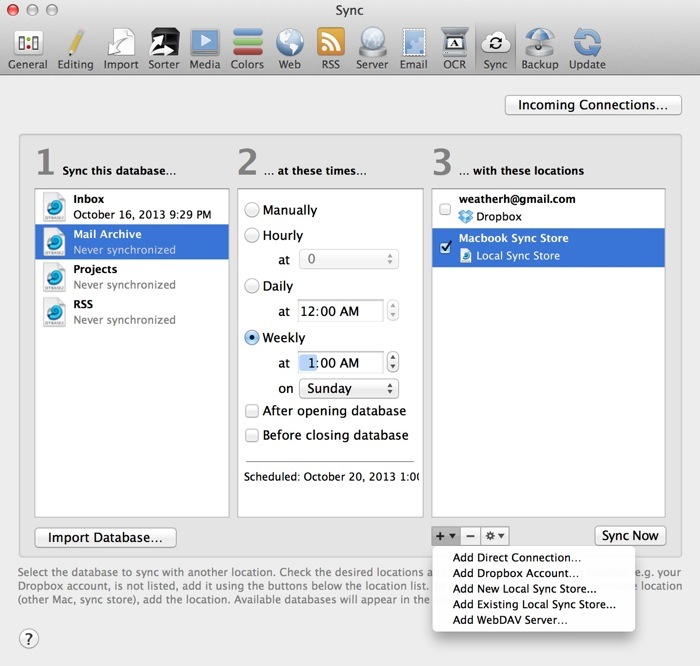 The fastest way to sync a database is Mac-to-Mac over a local network with both running instances of DEVONthink. Speed is not the most critical aspect of syncing for me, so I prefer the Local Network Syncin with a "Sync Store". This allows me to use a NAS as a central repository for some of my DTPO database files but keep all of the Macs on my network up to date. Just jump into the preferences for DEVONthink and add a database, then decide how often synchronization should happen. The final step is to choose all of the ways that the database should be kept in sync. You can setup multiple sync methods for each database in DEVONthink. This is a nice way to create a "set it and forget it" backup to a WebDAV while also syncing locally for network users. But what happens if your DEVONthink database references (indexes) files outside the database? Well, they thought of that too. The files are synchronized to the same locations on all computers. That's clever. DEVONthink also displays the sync progress and logs any problems it encounters. There's never a worry about what's happening. It's all transparent but well documented. The meta data and files in a DEVONthink database is encrypted with a unique database key and optional password when it is synced. This is a good level of security for a closed network with shared devices. It also means that the data isn't wide open when it's dropped onto a USB thumb drive. With the optional network and remote syncing, DEVONthink becomes a shared knowledge hub for any working group. Each person contributes and syncs data, but you maintain one canonical source for all information. 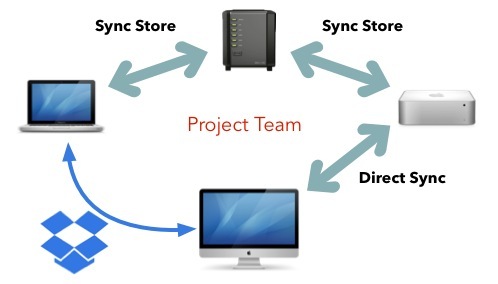 It's a great solution for a remote team working over Dropbox or a local team syncing directly. DEVONthink isn't just a shoebox for files. The built-in synchronization keeps everyone's search indexes up to date too. Everything in the file is just a quick search away. Or create a Smart Group to see just what was added in the last week. Smart Groups synchronize too. If you're a long time DEVONthink user like me, it's easy to forget that we no longer live in the digital shoebox era. There was a time when we saved everything to one disk and manually copied everything we wanted to share. Today's DEVONthink is a true collaboration tool with great synchronization options. Data can be used offline when necessary but also kept up to date without a bunch of dragging files around.